IRON REAGAN Announce Worldwide Tyranny! Richmond, Virginia’s IRON REAGAN are true road warriors. After just wrapping up an extensive North American run, the band has a quick break before heading over for their first-ever Australian tour. 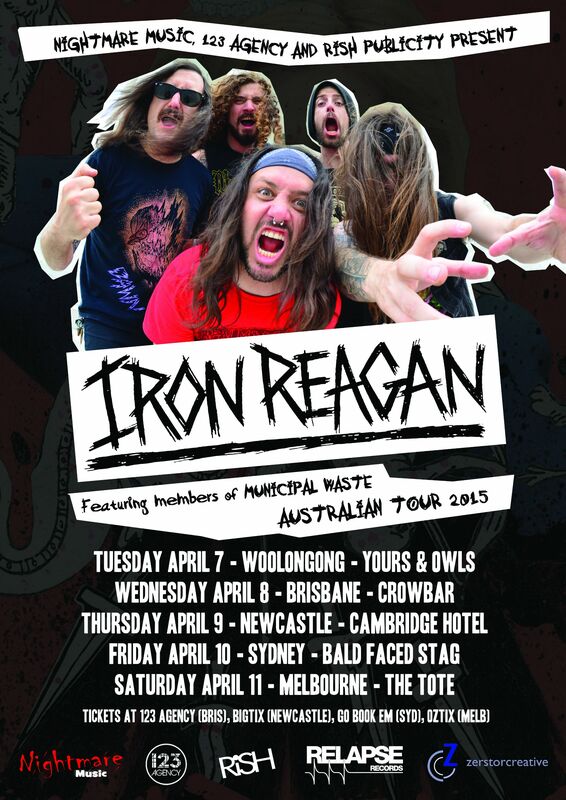 IRON REAGAN are set to head down under April 7 in Wollongong, NSW and wraps up April 11 in Melbourne, VIC. After Australia the band shows no signs of stopping as today they have announced a touring schedule that will keep them on the road through July! The band has announced new United States dates, European dates and a headlining UK Tour. A complete list of dates can be found below. The European dates include numerous festival appearances and the US dates will also feature Noisem and Angel Dust. Iron Reagan released their sophomore full-length The Tyranny of Will via Relapse Records last year along with the viral video directed by Whitey McConnaughy (Red Fang, ZZ Top) for the song “Miserable Failure”. Watch the video HERE and stream the full album HERE. 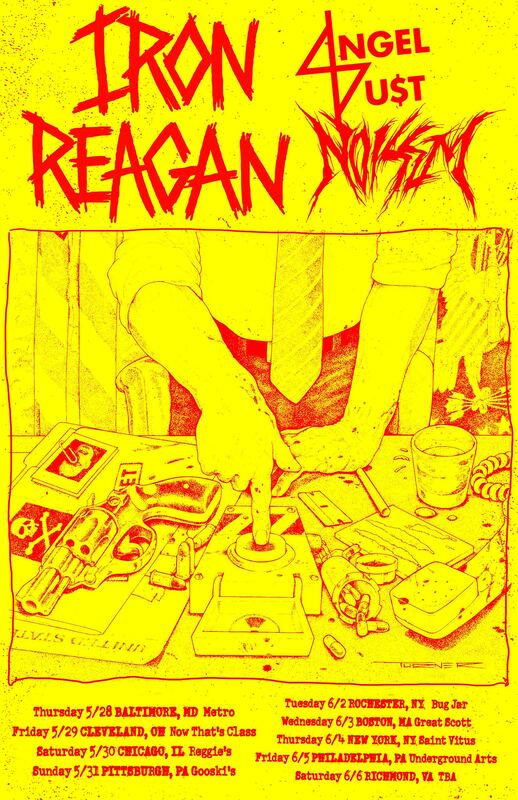 Fronted by the venomously lyrical Tony Foresta (Municipal Waste), on paper IRON REAGAN is a Richmond, Virginia super group (the band also features Phil Hall of Municipal Waste, Cannabis Corpse, etc. as well as Ryan Parrish formerly of Darkest Hour together with members of Mammoth Grinder). 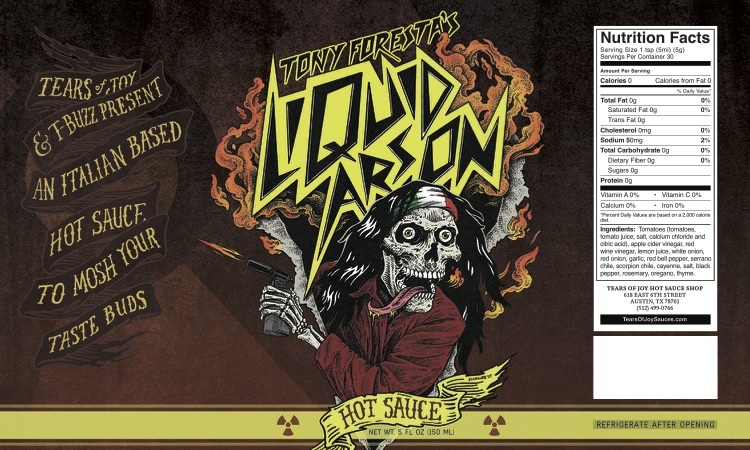 In other IRON REAGAN news lead singer Tony Foresta has released a brand of signature hot sauce called “Liquid Arson”. A collaboration with the renowned Tears of Joy Hot Sauce brand, Tony’s hot sauce is a mosh pit in your mouth with a 9 out of 10 heat rating and is available for purchase HERE. This entry was posted in METAL and tagged Iron Reagan, land phil, Municipal Waste, old school, Relapse Records, richmond metal, Thrash metal, tony foresta. Bookmark the permalink.